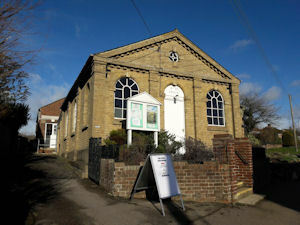 Geographically, Stondon Baptist Church is in Bedfordshire, and yet it belongs as a daughter church to Tilehouse Street in Hitchin, which is in Hertfordshire. Stondon was founded jointly by the fellowships of Tilehouse Street and Shefford as a mission station to a small hamlet community: at an unknown date, the link	with Shefford was broken. The present building is dated 1863. Ministry over the years has been provided by good friends, particularly from Tilehouse Street, along with lay pastors. Under Mr Sneath's pastorship the dream of a School Room was fulfilled in 1952. Whilst the church enjoyed good support from the people of the village over the next 30 to 40 years, due to various factors, decline set in the 1990s and worshippers	were in single figures. The trend reversed somewhat under the short lay	pastorate of Ian Horsler, but then a rota of different preachers and	once-a-month services on Sunday afternoons meant a decline once more. Mike Ewings became Lay Pastor in 1999 and	moved into the village with Helen, his wife, later that year. From 2001, services changed to Sunday mornings and weekly at 10.30am. In the following period, good relationships and contacts with other village organisations were reinforced, and regular assemblies at the village Lower	School established good relationships with both teachers and pupils. Being a village community, members of the Parish Church and ours already knew each other well. At present the parish has just appointed a new priest in charge and we look forward to working with him. Meetings between our two churches have formed a good working relationship. The chapel, with removable pews, is able to seat 70 people. The School Room is a good size with a stage, plus a kitchen and outside toilets. The buildings have been maintained in good order, but if we are to be a church available for the community, then a large financial outlay is required in order	to bring them up to the standards required nowadays. We shall certainly require wisdom to spend money that will facilitate a mission agenda and not just reinforce a maintenance mode. In August 2008, Mike Ewings retired from the pastorship at Stondon. By divine providence Rev. Jane Kingsnorth became available to be interim minister from September that year. She has since moved on to become a chaplain at a hospice in Ipswich. 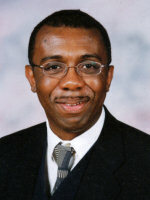 At the end of 2009, Mike Campbell became the part-time pastor at Stondon. Worshippers currently number around 10. Stondon is no longer a hamlet where, as some of the old folk remember, you could stand in the road and chat. Its five-mile proximity to Hitchin has greatly attracted developers and, for the District Council, the possibility of more Council Tax proceeds is difficult to resist. What is clear is that the development will attract more and more people to the village. We have had, at times in the last few years, a number of young people attending our Trailblazers Sunday School during morning worship. Recently we have again restarted our Sunday School during morning service. This runs monthly on the second Sunday of the month during morning worship.